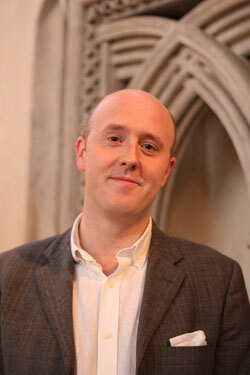 Mark Williams has been Informator Choristarum, Organist and Tutorial Fellow of Magdalen College, Oxford since January 2017. Magdalen College is the only institution to retain the ancient title of Informator Choristarum for its Director of Music, and holders of the post since the College’s foundation in 1458 include the composers John Sheppard, Daniel Purcell and Bernard Rose, and organists Sir John Stainer and Sir William McKie. He studied at Trinity College, Cambridge under Richard Marlow, and was for six years Assistant Organist of St Paul’s Cathedral and Director of Music at St Paul’s Cathedral School. Between 2009 and 2016, he held the post of Director of Music, College Lecturer and Fellow at Jesus College, Cambridge. He has appeared as organist, harpsichordist and conductor internationally and on disc with many of the UK’s leading ensembles, including the London Philharmonic Orchestra, the City of London Sinfonia, the Royal Philharmonic Orchestra, the Cambridge Singers, the Bournemouth Symphony Orchestra, The King’s Consort, The Sixteen, Arcangelo, Retrospect Ensemble, the Gabrieli Consort and Players and Cantores in Ecclesia. As a conductor he has worked with the Britten Sinfonia, London Mozart Players, Saraband Consort and City of Prague Philharmonic Orchestra, and he is the Principal Guest Conductor of the City of London Choir. Mr Williams has given solo recitals and led masterclasses in choral training, singing and organ performance in the UK, the USA, Asia and Africa. He appears on over 30 discs and a number of soundtracks. A Fellow of the Royal College of Organists, he is a Freeman of the City of London, and a trustee of the Oundle Music Trust, Cambridge Early Music, Songbound and the Muze Music Trust in Zambia. He is the Honorary President of the Chamber Choir of Erne Integrated College in Enniskillen. He has visited Portland for the William Byrd Festival every year since 2000, succeeding the late Richard Marlow as Artistic Director in 2014.